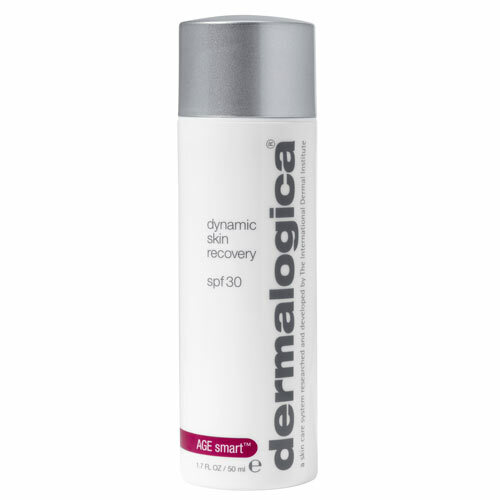 Hydrate and defend your skin with this Dermalogica AGE Smart Dynamic Skin Recovery SPF30 formulation. Its a medium-weight, emollient daily moisturizer that contains a patented polypeptide combined with Glucosamine and Soy. Its designed for mature and prematurely-aging skin, to stimulate collagen synthesis, and to enhance the skins natural ability to fight skin-aging free radicals. It also helps prevent signs of aging caused by AGEs (Advanced Glycation End-products), which is a damaging byproduct of sugar/protein reactions in the skin. Additionally, this moisturizer contains White Tea polyphenols to regulate the formation of collagen-degrading MMPs brought on by UV rays while tripeptides, stabilized Vitamin C, Yeast Extract and Phytoestrogens help catalyze the skins natural collagen production to enhance skin firmness. And as it assists collagen production, this moisturizer - SPF30 - also provides critical protection from daylight exposure. It blends smoothly into skin to create a perfect finish. Contains no artificial fragrance or color.